_by George Remaily - Click here to comment! On Tuesday afternoon Philadelphia Eagles owner Jeffrey Lurie held his annual “State of the Eagles” address and press conference. It was very strange - Lurie said everything to make one think that there was going to be a change with his head coach. Mr. Lurie voiced his frustration, stating that this was the most disappointing season as the owner of the Philadelphia Eagles; yet, at the end of the press conference, Andy Reid was still the head coach of the Philadelphia Eagles. He also said that the Eagles would win the Super Bowl and the head coach to lead them there would be Andy Reid, and added that he is well respected in the National Football League. However, Mr. Lurie, is that a reason to keep Andy on as the head coach of the Eagles? Going into the 2011 season the Eagles had signed some pretty good free agents and the team was picked by many to not only go to the Super Bowl, but also to win it. Another questionable factor was the defensive coordinator; during the off season Andy Reid hired offensive line coach Juan Castillo as his new defensive coordinator. A lot of people were questioning that decision because Juan had no NFL experience on the defensive side of the ball. There were high expectations for this team. The defense looked confused, lacked discipline, and were not making plays, which proved Juan was in over his head. Andy Reid was responsible for hiring him; his reason for hiring Juan was that he was impressive during the interview process, which is obviously not an appropriate motive to hire a guy who has no defensive coaching experience in the NFL. As the head coach of the Philadelphia Eagles for 13 years, he has made them a competitive team and has had the most victories for any Eagles head coach in their history. Nonetheless, he still makes the same mistakes over and over. He is a poor game day coach and his clock management is very bad. Sometimes a head coach can only take a team to a certain point and just cannot get them to the next level. Andy Reid has taken the Philadelphia Eagles to five NFC Championships Games, one of which they won, and went to one Super Bowl, which he lost in 2004 to the New England Patriots. Mr. Lurie, you have a head coach in Andy Reid who just cannot get this team to the next level. There are two former head coaches in the NFL that are working on television right now that have each won a Super Bowl - Bill Cowher and John Gruden. Both have stated this year that each would like to be a head coach in the NFL in 2012. Why not go with one of these two? It guarantees a new plan and a new attitude. Thirteen years as been long enough and the proof is in the pudding. 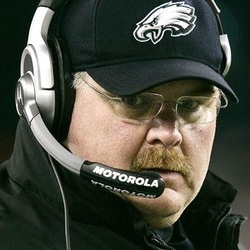 The Philadelphia Eagles will not win a Super Bowl with Andy Reid. Jeffrey Lurie also stated that any coaching decisions that are going to be made will be made by Andy Reid. In order to fix the harm done, Andy should release Juan from his defensive coordinator position and should hire recently fired St. Louis Rams head coach, Steve Spagnuolo. Spagnuolo was a part of Andy Reid’s coaching staff until 2007 when he went to the New York Giants as their defensive coordinator, and helped guide the Giants to the Super Bowl title. He has the resume and the championship to back it up. Andy Reid needs to fix the mistake he made - he needs to put his ego aside and change his defensive coordinator. Andy could show a lot of people that he is committed to winning and that although he made a mistake, he is willing to fix it by going with a verified winner in Steve Spagnuolo. The question is, will Reid do that? Most think not, and that Juan Castillo will come back for the 2012 season as the Philadelphia Eagles defensive coordinator. Lurie and head coaching of Andy Reid, will never win the Super Bowl. Mr. Lurie has said that the model he follows in regard to franchises is the New England Patriots. Really, Mr. Lurie? Well the Patriots have won three Super Bowls. How many have the Philadelphia Eagles won under your leadership? That number is zero. Mr. Lurie had made a lot of money owning the Eagles and the Eagles’ total worth has gone up under his ownership. Andy Reid has been a part of that. Fans continue to buy tickets and Eagles merchandise. The current Eagles administration only desires and worries about the Eagles staying competitive. Is there a commitment to winning? Well, Philadelphia Eagles fans, how many Super Bowl rings does this organization have? Ultimately, this is a business for Jeffrey Lurie, Joe Banner, and Andy Reid, and the main prerogative is money. This is not about winning championships. The status quo will continue for as long as this current administration is running the Philadelphia Eagles. Will this team win a championship? Well, what have they done the previous 13 seasons? Mr. Lurie, it was time for a change and you did not make it.